Here is a file set that I created in honor of today’s festivities. It would also be perfect for your football player’s memories. helmets, a football, shoulder pads and goal post. 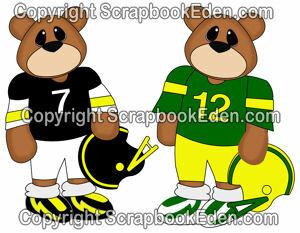 Of course the bears are in the “colors” of this year’s teams, but can be easily changed to reflect your team’s colors. It is at a special introductory price of only $4.99. The purchase includes the files in the following formats: AI, DXF, EPS, GSD, KNK, MTC, SVG, WPC and WPC14. You can purchase it through this button. Be sure to stop back tomorrow. I will be participating in a fun birthday blog hop and will have this new file set releasing. they are so cute!! GO STEELERS!! !